The Royal Horticultural Society has put forward ten plants that have been launched at the Chelsea Flower Show since 1913, one for each decade, and is asking the public to vote for the one they think should be awarded the title of RHS Chelsea Flower Show Plant of the Centenary. The RHS has invited ten amateur gardeners, entitled the ‘Plant Champions’, to propose to the public why each plant should ultimately win in order to help people cast their vote. The gardeners have been chosen because of a specific link or passion with the plant they are representing and because they were born in the same decade of their particular plant. Rosettes of silvery foliage topped with magnificent arching spikes of frothy white flowers. Raised in 1913 by renowned rock garden specialist Captain Symons-Jeune, it won the Award of Merit in 1920. Introduced by Victorian plant hunter George Forrest, this elegant evergreen shrub made its debut at Chelsea in 1924. It has brilliant red young growth and large, slightly fragrant flower panicles. 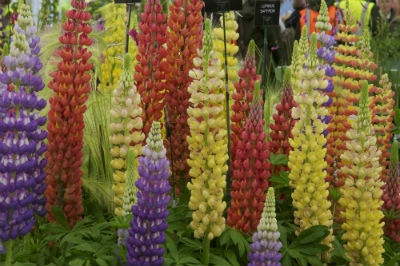 Decades of work by plant breeders trying to increase the colour range of lupins were rendered superfluous by George Russell, who in 1938 revealed the rainbow palette of lupin cultivars he had bred. Chelsea visitors were dazzled by the Baker’s Nursery display of these plants in 1939. An evergreen species with bell-shaped white flowers, this plant was discovered on the Japanese island of Yakushima. The plants were first exhibited at Chelsea in 1947 to great acclaim. 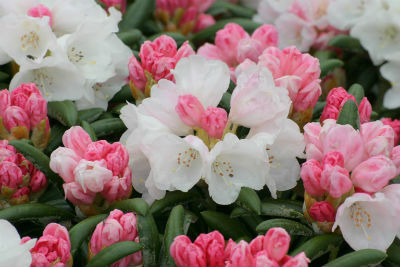 This species has been hugely influential in the development of rhododendrons for smaller gardens. This pure white Floribunda, from German rose breeder Reimer Kordes, stole the show at Chelsea in 1958. It’s probably still one of the best-known of all roses. A small tree with showy white bracts in May and brilliant autumn colour. Bred by Canadian nurseryman Henry M Eddie, it won Chelsea’s Award of Merit in 1972. This perennial grows up to 75cm high, has mauve flowers and glaucous leaves and can flower for almost the whole year. An Award of Garden Merit plant, it was named in honour of the plantsman E A Bowles and was first shown at Chelsea in 1982. Shown first at Chelsea in 1983, this plant was raised and selected from seed sent from America. It was the first heuchera to become widely popular as a flowering foliage plant, starting one of the major plant fashions of the last quarter century. Exhibited first in 2000, this geranium is tall and fast-growing, with violet-blue flowers streaked with red. It is probably the bestknown hardy geranium cultivar. Raised by Lynne Dibley of Dibleys Nurseries and making its debut at Chelsea in 2010, ‘Harlequin Blue’ has short flower stems and compact leaves. This plant won the RHS Chelsea Flower Show Plant of the Year award in 2010. Voting opens on 22nd April and continues until noon on Friday 24th May. In order to vote you can go online and watch the ‘Plant Champions’ discuss each plant at www.rhs.org.uk/chelsea/potc or you can cast your vote at the Chelsea Flower Show itself, in the Great Pavilion.